With its dramatic vistas, its attractive, hospitable people and its rich cultural traditions, the magical isle of Bali has captured the hearts and imaginations of millions, ever since visitors from the West began to arrive in the early 20th century. Incredibly, ancient Balinese cultural traditions remain intact today, even in the face of 21st century modernity and a highly developed tourist industry. However, few visitors ever really begin to understand the colourful pageantry that surrounds them virtually everywhere they travel on the island. 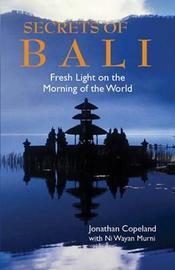 Secrets of Bali is the key to this understanding. From Balinese life, religion, festivals and offerings, architecture, music, dance, textiles, dress, carvings and paintings, masks, manuscripts, cuisine and much more, this is the one book to which the visitor can turn for the answers. A 'must' for foreign visitors, residents, and those everywhere who have fallen under the spell of "The Morning of the World". Jonathan Copeland studied law at University College London, and practised in the City of London for 25 years. Throughout that time he travelled to Southeast Asia annually and developed a passion for Balinese culture and a strong desire to fully understand it. After leaving the law he was able to spend more time in Bali, researching all aspects of Balinese culture. The fruits of that research appear in this book. Ni Wayan Murni,is a legendary pioneer of Balinese tourism who participates in Balinese culture on a daily basis and plays in a gamelan group at important religious ceremonies.